The overall objective of these projects is to illuminate the role of hydrogen bonding, hydrogen tunneling, electrostatics, and conformational motions, as well as the impact of distal mutations, in enzyme reactions. Movies of hydrogen tunneling in LADH and DHFR are available below. 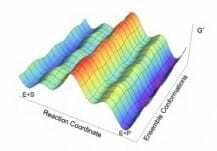 Our simulations suggested the concept of a free energy landscape for enzyme catalysis and the significant role of equilibrium, thermal conformational motions that lead to sampling of configurations conducive to chemistry. We have applied this hybrid approach to hydride transfer in liver alcohol dehydrogenase (LADH),34, 37, 41, 48 dihydrofolate reductase (DHFR),50, 51, 56, 63, 67, 71, 80, 83, 84, 113, 165, 179, 185 and ketosteroid isomerase (KSI)121, 127, 143, 159 These simulations have illuminated the roles of hydrogen bonding, hydrogen tunneling, electrostatics, and conformational motions, as well as the impact of distal mutations. 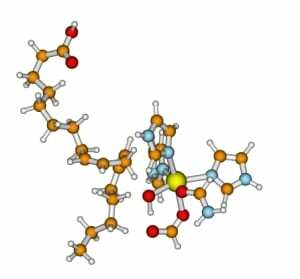 The specific method we used to study the catalytic role of the third active site divalent metal ion was a finite temperature string method with umbrella sampling in conjunction with a QM/MM treatment. We used this approach to generate the minimum free energy path and the relevant regions of the multidimensional free energy surface for the phosphoryl transfer reaction (Figure 1). We also investigated the possibility of proton transfer from the incoming nucleotide to the pyrophosphate leaving group. Our simulations considered both sequential and concerted mechanisms for the phosphoryl transfer and proton transfer steps. Figure 1.Proposed mechanism of Pol η. An undetermined base B deprotonates O3′ of thymine, preparing it for phosphoryl transfer (red arrows in reactant). A possible self-activating deprotonation of the incoming nucleotide (adenine) was also studied (shown with question mark in product). Coordination of the third metal to the leaving group is also shown in product. 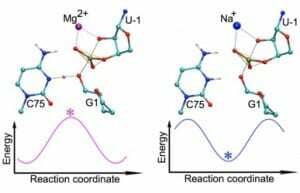 A comparison of the minimum free energy paths and free energy surfaces for the reaction with two and three divalent metal ions in the active site elucidated the possible role of the third metal ion. 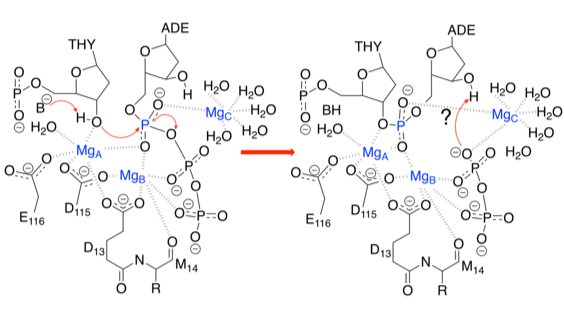 For the two-metal system, the minimum free energy path corresponds to a sequential mechanism, in which the phosphoryl transfer reaction is followed by relatively fast proton transfer. For the three-metal system, the minimum free energy path corresponds to only the phosphoryl transfer reaction without a subsequent proton transfer reaction. 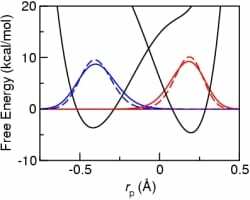 Our analysis indicates that the proton transfer reaction does not occur in the three-metal system because of electrostatic effects, where the positively charged metal ion partially neutralizes the negatively charged leaving group and thereby disfavors protonation. Moreover, these electrostatic interactions stabilize the product, making the phosphoryl transfer reaction more thermodynamically favorable with a lower free energy barrier relative to the activated state corresponding to the deprotonated 3’OH nucleophile.